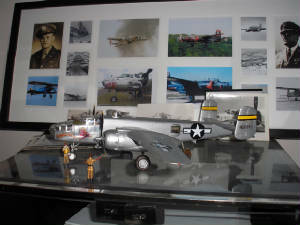 I read through the material that you developed on the North American B-25 Mitchell website. 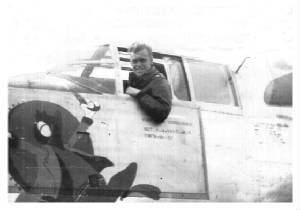 As I looked through the section on nose art, I thought of sending you some photos of my Dad's B-25, including its nose art. During WWII, Dad flew from a base in Corisca (Ghisonaccia Airfield). 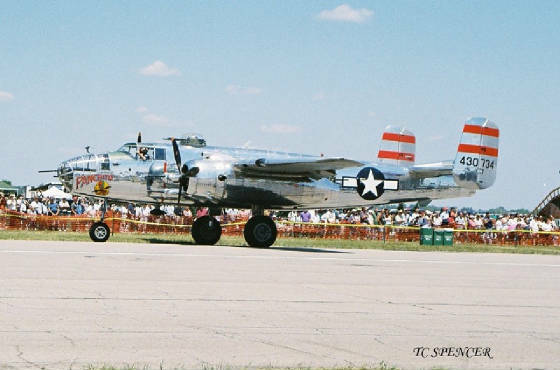 A B-25 navigator in a neighboring squadron, Joseph Heller, later wrote "Catch 22". During the time Dad was there, the men in his outfit be-friended adults and children in a nearby village. One of those "kids" became a noted French Economist, Dr. Dominique Taddei. Dr.Taddei researched and wrote a book about these American Airmen, "USS Corisca". 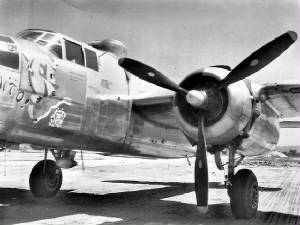 As part of the research, he hired an artist to reproduce the nose art of many of the B-25s in dad's Bomb Wing (the 57th BW). He sent me a copy of the nose art for Dad's plane (Disney's character, Panchito). 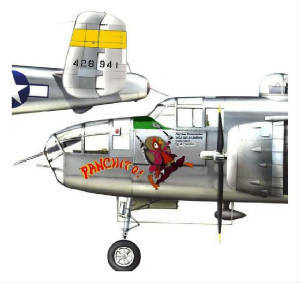 I built a model of that plane, using Testor's decal kit allowing me to customize that model to resemble Panchito (See photos below). Now I plan to read about what you wrote about the North American B-26 Invader. Dad also flew a black painted "Night Intruder" model during the Korean War in the 17th Bomb Squadron (the "Royal Bengals"). Another bit of information about Dad; one of his proudest moments from WWI came after he led a successful 48 B-25 mission over the Brenner Pass. He was mentioned by name in an Axis Sally radio broadcast. He received a Distinguished Flying Cross and five Air Medals during his WWII tour. And if you have a French speaking friend, I can send you another of Dad's stories that was included in Dr. Taddei's book. Oh, a note about my aviation background, Cold War USAF veteran (Air Intelligence staff member at the PACOM Elint Center and at HQ SAC Directorate of Intelligence, Offut AFB), retired Boeing manager (Industrial Engineering & Human Resource Development), and currently; member of the Cascade Warbirds EAA Squadron & the Aerospace Education Officer, Northshore Civil Air Patrol Squadron, Bothell, Washington. Donaire Inc, Phoenix, AZ, 1963. Hubert H. Clemens, Indiantown, FL, 1966. Clements & Howe Aviation, Indiantown, FL, 1969-1972. SST Aviation Museum, Kissimee, FL, 1973-1982. BOM Corporation, Wichita Falls, TX, 1982-1990. - Rebuilt at Kissimee, FL. - First flight Mar. 1986. - Damaged on landing Wichita Falls, TX, Sept. 19, 1988. Richard F. Korff, Lewiston, NY, 1991-1999. Rag Wings & Radials Aircraft Leasing LLC, Wilmington, DE, 1999-2005. Note: FAA changed id from 43-36074 to 44-30734 in 1972.